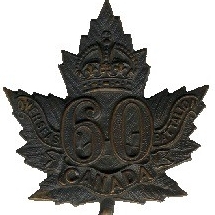 The Newfoundlanders – The 60th Battalion C.E.F. "Victoria Rifles of Canada"
During the First World war Newfoundland was the “Dominion of Newfoundland”, it did not become part of Canada until 1949. This tiny country raised it’s own Regiment – the 1st Newfoundland Regiment. It served as a battalion of the British Army. Newfoundlanders also served with the 60th Battalion. This nominal roll is the roll of men who served in the 60th Battalion and listed Newfoundland as their country of birth on their attestation papers. 3 Men were awarded the Military Medal for bravery.